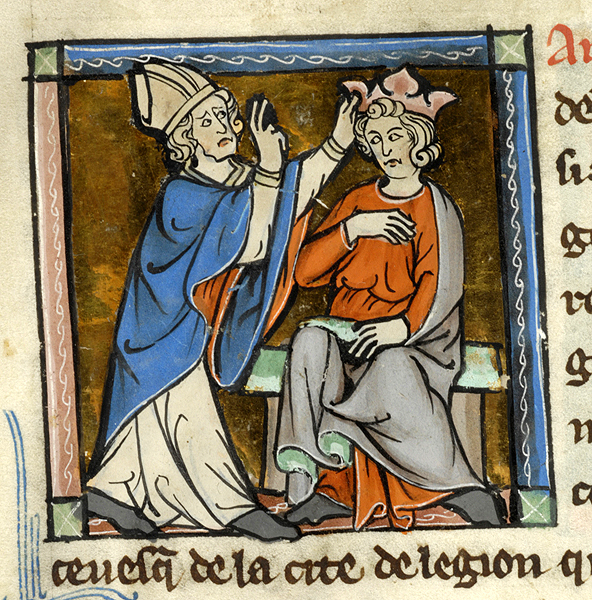 This image, from the fourteenth-century Abrégé des histoires divines found in the Pierpont Morgan Library, shows the coronation of King Arthur performed by a bishop. It is generally accepted that Arthur, though a popular literary figure, was not a real historical figure in the way he is written about in literature. The Last Legion depicts Arthur not as a Welsh warrior-king fighting the invasion of Saxons, but as the son of Romulus Augustus, the last Roman Emperor in the West. While the aesthetic of the movie is mostly late antique, this illustration depicts Arthur through the artistic conventions of the high medieval period. 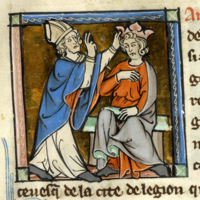 “Detail of image depicting the coronation of King Arthur (c. 1300-1310) from Pierpont Morgan Library, MS M. 751,” Medieval Hollywood, accessed April 24, 2019, http://medievalhollywood.ace.fordham.edu/items/show/86.